Today was the English Speaking Contest. 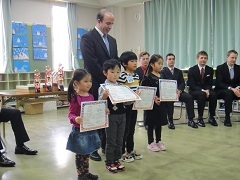 We had the kindergarten contest in the morning and the Elementary school contest in the afternoon. A message from Mr Tom: Today I was very impressed with all the children. The level this year was very high. It was wonderful hearing about different items and chatting with everyone. Well done.